Johan Vilhelm (John William) "Bill" Granberg was born October 31, 1901, in Nederluleå, Norrbotten, Sweden, and died February 2, 1985, St. Anthony's Hospital Central, Denver, Adams Co., CO, at age 83. He is the son of Nils Emans Nilsson of Sweden, and Charlotta Vilhelmina Engman of Sweden. Myrtle Katherine Nelson was born August 29, 1901, in Rockford, Winnebago Co., IL, and died July 18, 1994, in Denver, Adams Co., CO, at age 92. She is the daughter of Clarence Cornelius Nelson of Rockford, Winnebago Co., IL, and Edith Christina Larson of Farmington Twp., Waupaca Co., WI. 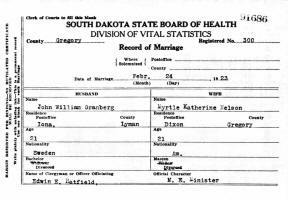 John William "Bill" Granberg and Myrtle Katherine Nelson were married on February 24, 1923, in Gregory Co., SD. William Berthal "Bill" Granberg: Born November 19, 1925, in the Village of Prentice, Price Co., WI; Died March 31, 1993, in New York City, New York Co., NY (age 67). Married July 2, 1970, in Manhattan, New York City, NY, to Gabriella T. Piomboni: Born September 1, 1954, in Unknown. Divorced before 1992. Gabriella then married 1992 in Manhattan, New York City, NY, to Stefano Campolmi: Born Unknown. Geraldine Joyce "Geri" Granberg: Born November 3, 1929, in Gregory Co., SD. Married June 18, 1950, in Hot Springs, Fall River Co., SD, to Gerald Laverne Krutsch: Born October 28, 1923, in South Dakota; Unknown. Francis Emil "Frank" Granberg: Born August 20, 1934, in Winner, SD. Married April 30, 1955, in Los Angeles Co., CA, to Arline Joy Wibe: Born October 12, 1934, in Los Angeles, Los Angeles Co., CA. She is the daughter of Orville Willard "Bud" Wibe of Osage, Mitchell Co., IA, and Hilda Christine Louise Helzer of Palmer, Hall Co., NE. Myrtle Katherine Nelson was born August 29, 1901, in Rockford, Winnebago Co., IL. Johan Vilhelm (John William) "Bill" Granberg was born October 31, 1901, in Nederluleå, Norrbotten, Sweden. Johan Vilhelm (John William) "Bill" Granberg Birth Record. The Granberg family departed April 25, 1902, from Liverpool, England, aboard the S. S. Celtic, arriving in the Port of New York on May 3, 1902. The 1910 U. S. Census taken on May 3, 1910, shows Clarence C. Nelson (age 31) born in Illinois to Swedish-born parents is a General Farm Farmer owning his farm and is living in Dixon Twp., Gregory Co., SD. Living with him is his wifeof 10 years, Edith C. Nelson (age 27) born in Wisconsin to Swedish-born parents, with all five of the children born to her still alive. Also living there are his children: Myrtle C. Nelson (age 8) born in Illinois; Hazel M. Nelson (age 7) born in Illinois; Paul E. Nelson (age 5) born in Illinois; Fern E. Nelson (age 2) born in South Dakota; and Olive S. Nelson (age 1/12) born in South Dakota. The 1920 U. S. Census taken on January 13, 1920, shows Clarence C. Nelson (age 41) born in Illinois to Swedish-born parents is a Farmer owning his own farm and living in Dixon Twp., Gregory Co., SD. Living with him is his wife Edith C. Nelson (age 36) born in Wisconsin to Swedish-born parents. Living with them are his nine unmarried children, all born to Illinois and Wisconsin-born parents: Myrtle K. Nelson (age 18) born in Illinois, a Rural School Teacher; Hazel M. Nelson (age 17) born in Illinois; Paul E. Nelson (age 14) born in Illinois; Fern E. R. Nelson (age 12) born in South Dakota; Laurel V. Nelson (age 9) born in South Dakota; Walter R. Nelson (age 4-7/12) born in South Dakota; Violet T. Nelson (age 1-7/12) born in South Dakota; and Norman N. Nelson (age 1/12) born in South Dakota. Clarence C. Nelson was the census enumerator. 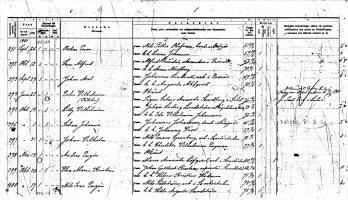 The 1920 U. S. Census taken on January 21, 1920, shows John Gronberg (age 41) born in Sweden to Swedish-born parents and having emigrated in 1902 and becoming a naturalized citizen in 1909 is a Farmer owning his farm with a mortgage and is living in Prentice Twp., Price Co., WI. Living with him is his wife Charlotte Gronberg (age 42) born in Sweden to Swedish-born parents and having emigrated in 1902 and becoming a naturalized citizen in 1909. Living with them are his three unmarried children, all born to Swedish-born parents: John W. Gronberg (age 18) born in Sweden and having emigrated in 1902 and becoming a naturalized citizen, who is a Laborer; Anna M. Gronberg (age 11) born in Wisconsin; and Carl H. Gronberg (age 10/12) born in Wisconsin. 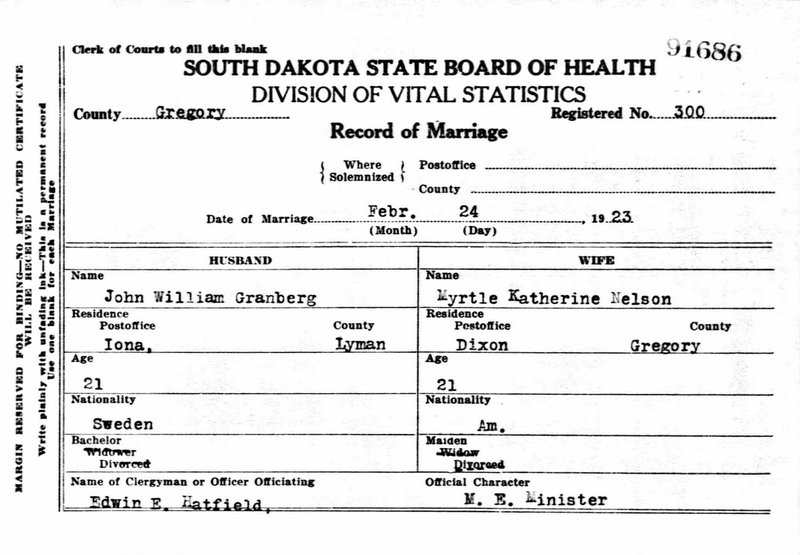 John William "Bill" Granberg and Myrtle Katherine Nelson were married February 24, 1923, in Gregory Co., SD. John William "Bill" Granberg and Myrtle Katherine Nelson Marriage Record. The 1930 U. S. Census taken on April 17, 1930, shows Wm. J. Granberg (age 28) born in Sweden to Swedish-born parents having emigrated in 1902 and a naturalized citizen and first married at age 21 is a Garage Blacksmith owning his own home and is living in Dixon Twp., Gregory Co., SD. Living with him is his wife, Myrtle K. Granberg (age 28) born in Illinois to Illinois and Wisconsin-born parents. Living with them are his two children, both born to Swedish and Illinois-born parents: William B. Granberg (age 4) born in Wisconsin; and Geraldine J. Granberg (age 4/12) born in South Dakota. Note: Clarence Nelson was the Census Enumerator. 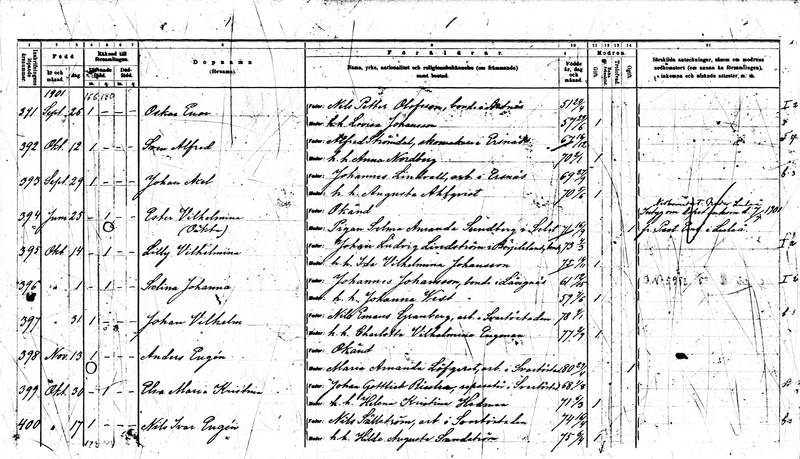 The 1930 U. S. Census taken on April 10, 1930, shows John Granberg (age 54) born in Sweden to Swedish-born parents and having emigrated in 1899 and a naturalized citizen and first married at age 33 is a Farmer owning his own farm and is living in Prentice Twp., Price Co., WI. Living with him is his wife Helga M. Granberg (age 46) born in Sweden to Swedish-born parents and having emigrated in 1903 and a naturalized citizen and first married at age 25. Also living at home are John's two children, both born in Wisconsin to Swedish-born parents: John E. Granberg (age 14); and Carl O. Granberg (age 10). The 1940 U. S. Census taken on April 29, 1940, shows J. W. Granberg (age 38) born in Sweden, and 5 years ago was living in the Same House, and with 8 years of School, and a Naturalized Citizen, is a married Garage Owner Attendant, and who owns his home worth $2,000 and is living in Dixon Twp., Gregory Co., SD. Living with him are: his wife, Myrtle Granberg (age 38) born in Illinois, and 5 years ago was living in the Same House, and with 3 years of High School; his son, Berthal Granberg (age 14) born in Wisconsin, and 5 years ago was living in the Same House, and with 8 years of School; his daughter, Geraldine Granberg (age 10) born in South Dakota, and 5 years ago was living in the Same House, and with 4 years of School; and his son, Francis Granberg (age 5) born in Wisconsin, and 5 years ago was living in the Same House. MELLEN - Funeral services for Elof N. Granberg, 77, who died last Friday at Plantation, Fla., were held at 11 a. m. Tuesday at the Congregational United Church of Christ here with the Rev. Larry Davis officiating. Burial was at Mellen Union Cemetery. Mr. Granberg was born Jan. 14, 1898 in Sweden and was married to the former Tessie Cregor, who died Aug. 26, 1967. He operated a grocery and meat market in Mellen for many years. Survivors include a daughter, Mrs. John Delaney, Plantation; two grandchildren, and two brothers, John, Prentice, Wis., and William, Denver, Colo.
John William "Bill" Granberg died February 2, 1985, at St. Anthony's Hospital Central, Denver, Adams Co., CO, at age 83. Myrtle soon moved to a retirement community, Sunny Acres of Colorado, 2501 E. 104th Ave., Apt. #57, Denver, CO, in order to be near people. Myrtle Katherine (Nelson) Granberg died July 18, 1994, in Denver, Adams Co., CO, at age 92. 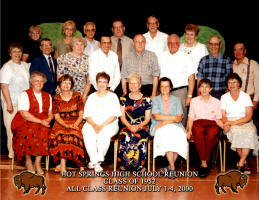 Geraldine Granberg Krutsch, middle row, second from left. 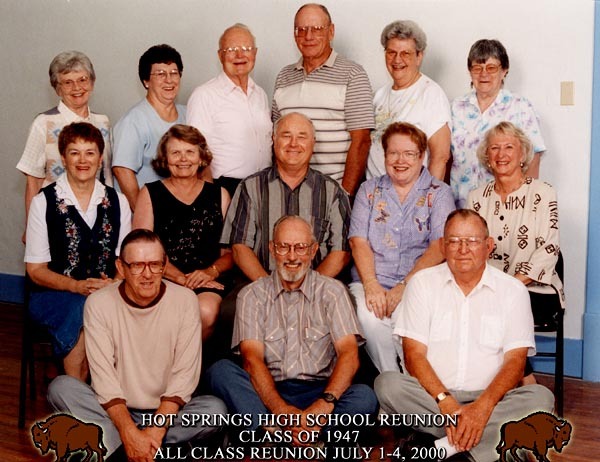 Francis Emil "Frank" Granberg, middle row, third from right.